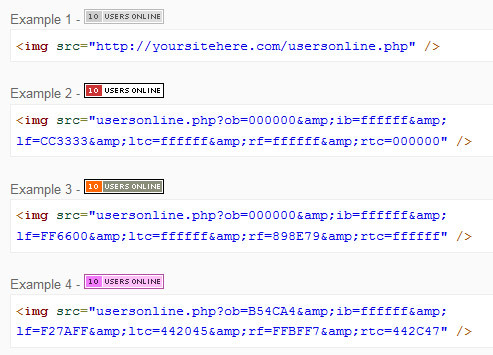 This is a quick and simple PHP script that shows the number of online visitors on your website at the moment in the form of a small graphical button, and of course it is available for free. This Users Online script will generate a small clean and cool looking image displaying the number of visitors viewing your site. The graphics is being generated on the fly with the help of the GD library, so make sure your hosting has it installed. And you can customize the colors of the button the way you like them in order to make them fit your website’s color palette as they are not hard-coded in the script itself. The look of the generated button style image by the PHP script is easy to customize by editing the script file or on-the-fly by changing the parameters for displaying the image. Of course there is a basic gray color palette preset in the script, so it will be used if you do not provide parameters for the inner border, the outer border, the left and right fill colors and.or the left and right text colors (it is fully customizable). The advantages of this user counter PHP script are, it doesn’t require a MySQL or any other database in order to run (it stores the information in a plain text file) and it allows you to display this information on any web page, even ones that are not dynamically generated, so you are not just limited to active PHP pages anymore.